It is Friday. I’m a little bit tired and homesick. I decide against spending the afternoon alone. 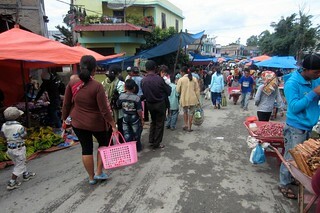 The students also have a free afternoon, so I soon I find myself walking through Balige’s streets with a small group of students to the traditional market. Every day there are people selling their wares, but one day a week there is a special market. 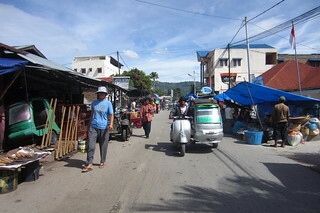 The streets in town are lined with people selling everything from fish to fruit to vegetables to shoes to used clothes and traditional Batak clothes. 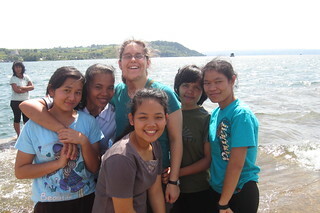 As one of the students takes my arm, enthusiastically guiding me across the street, she asks about culture. 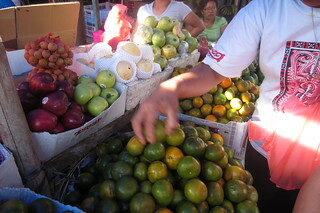 “Is the market in your country like this?” At first, I struggle to answer, not because the question is difficult, rather my attention is elsewhere—at my feet, looking for potholes or other obstacles; beside me, careful of the cars, motorbikes, and people passing by; and all around, as we pass piles of dried fish next to a table of fruit next to a seller of toiletries and soap. I answer something like, “yes, but no.” My hometown of Seattle is blessed to have the famous Pike Place Market and even better markets throughout the neighborhoods. I note, as we stop to wait for the group to look through a pile of shirts, that our outdoor markets don’t have clothes, and things are ordered. Well, at least, you won’t find a bar of soap being sold next to a pile of dried fish in America. And most people in America buy their food in stores, with sections of produce and aisles of pre-packaged goods. 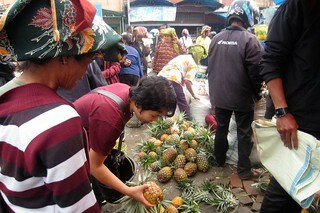 Here in Indonesia, the street market is the lifeblood for the people. There are no supermarkets in small towns and villages here. The people buy their week’s worth of food—fish, rice, fruit, vegetables, chilis, and meat—as well as get shoes repaired or buy coffee or any number of items. Somehow a small pile of apples from Washington state found its way to this small town in the middle of an island in SE Asia. Balige is quite the trek through mountainous and windy roads dotted with potholes; I know how far those apples have come. I had never given much thought to how significant the apple is in American culture until I came to Indonesia. Sure, we say something is “American as apple pie.” But we take for granted the plentiful bounty of apples all year round. Me especially, being from Washington state near a source of orchards and a major exporter of the fruit. “ahh. uhmm. We don’t have that in America”. I find myself stammering more than once (at the market, and in the kitchen). Their eyes grow wide with surprise. So different we are—skin color, language, and food. I tell my students that where I live in America we do not have fresh papaya, nor guava nor starfruit. Yes, so much different between us, and yet we share a common love of God and neighbor. I don’t talk about apples with the students (maybe another time) but it comes to my mind as I continue to see the differences in our cultures and foods. I make note to have a conversation class about food. 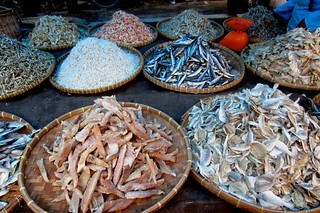 I am learning about food here: bakso, mie goreng, sak sang, ikan jahir, and more. Much for me to learn, too. Refocusing myself back to the market again, I delight in the company of my cheery students and observe the bustle around us. We walk past a butcher with a sliced up pig and over to a stand selling fried banana. We eat and they continue to ask me questions. My presence here is not only to teach in the classroom, but to be in the community. The bonus is we come to know each other more deeply. And this is a learning experience for all of us—they practice their English and I learn about Indonesia and the Batak people. We continue to laugh about the differences. Ah, Megan, I can read your homesickness in your lavish descriptions of everything having to do with apples! Such simple things we take for granted; I know I would really miss apples, too. What a gift you and those students are to each other, as you share these experiences and talk about the differences–and similarities–in your backgrounds. I love seeing your pictures and reading your descriptions of life there, and I can’t help but think that you’re learning the language so much more quickly than most people would be able to do.